Gold Bug begins just after the Formic Wars (also known as the “Bugger Wars”), when Andrew “Ender” Wiggin arrives in a colony ship on one of the former formic worlds as the new governor. 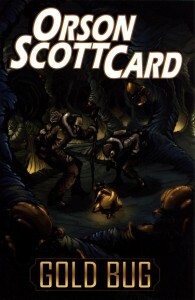 The story follows a former pilot named Sel Menach, a xenobiologist who has spent the bulk of his life after the war in the fledgling colony working with the terrestrial plants the colonists brought along, learning to protect them from parasites and helping them to adapt to the climate patterns of the new world. Eventually, he is elected governor, until a replacement arrives – Ender Wiggin. a colony ship on one of the former formic worlds as the new governor. Due to the technical aspects of relativistic space travel, fourteen-year-old Ender finds himself in charge of a colony that has existed for decades without him, and many of the younger colonists resent the fact that the Fleet has sent a “mere child” to be their governor. But the older generation, comprised of former pilots and ships’ officers who fought under Ender’s command during the war, ensures that the younger colonists know that this is the mind who made everything possible. Upon Ender’s arrival, Sel realizes that there is still much to learn about the rest of the planet, and obtains permission from Ender to explore past the reaches of the colony and see what lies beyond in the cold reaches of the south. But what Sel finds in his journey is something that may change the way the formics are understood by human scientists… and something that may give him a lifetime of new frontiers to explore.